New England Central and the Coast Guard Eagle—New London, Connecticut. Mike Gardner and I made an epic chase of New England Central freight 608 on Halloween Day 1997. Among my favorite views from that day is this color slide exposed from a footbridge along the Thames River at New London, Connecticut. In the distance is US Coast Guard training ship Eagle. Two years later I stood on the deck of the Eagleat the Irish port of Cobh in County Cork, having arrived by train from Cork city. Tonight, February 28, 2019 at 730pm, I’ll be giving an old school slide show to the Irish Railway Record Society, located opposite the Heuston Station car park in Dublin. Among my featured railroads will be New England Central. 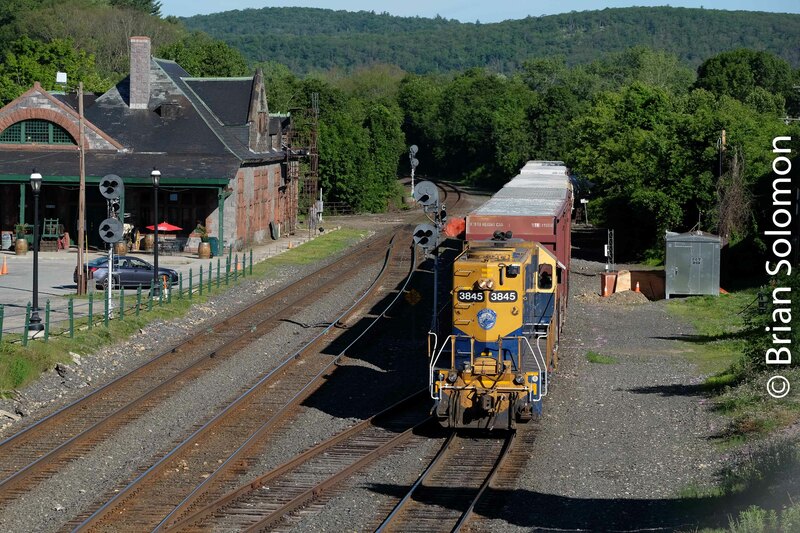 New England Central 608 at Stafford Springs—Part 4. Last Tuesday was another sunny afternoon, and so another opportunity to photograph 608 New England Central rolling through downtown Stafford Springs, Connecticut! This time I worked with my FujiFilm XT1 with 12mm Zeiss Touit lens. As the train eased through town I made my way to another location for an additional photograph. Stay tuned! Vintage Chrome: Millers Falls High Bridge—Then and Now. You’ll need to click on Tracking the Light to see the vintage photo. On January 25, 2019, Pat Yough and I were aiming to catch New England Central 611 on the Millers Falls high bridge over the Millers River. This stunning 1905 pin-connected deck truss has been one my favorite spans to photograph in Massachusetts. 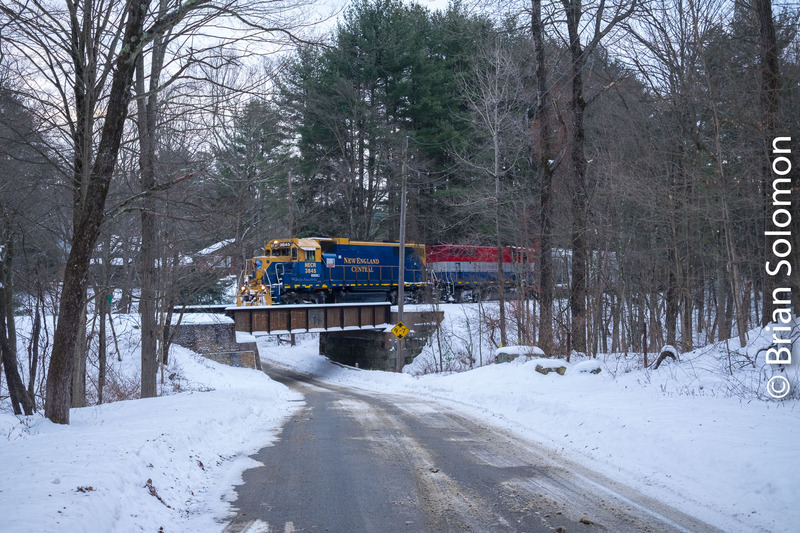 New England Central 611 at Millers Falls, Massachusetts on January 25, 2019 Exposed using a FujiFilm XT1 digital camera with 27mm pancake lens. 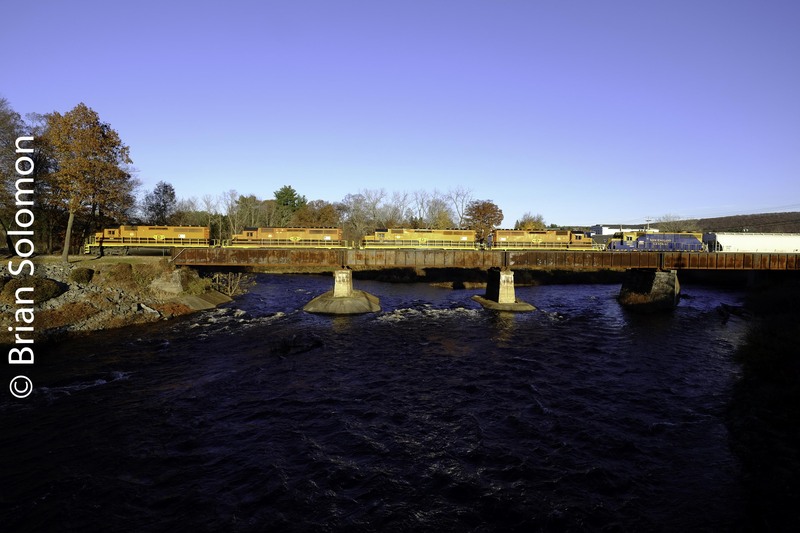 I made my first photographs of the bridge nearly 33 years ago: On May 14, 1986, I’d followed Central Vermont 447 north from Amherst (where I was enrolled at Hampshire College). The train was running at an abnormal time, which gave me the opportunity to make a late afternoon photo at Millers Falls. Although I made some nice sun lit photographs on Kodachrome 64 of the CV GP9s and CN M-420 diesel working across the bridges, two problems vexed me and resulted in these slides spending more than three decades in the ‘seconds file’. As the train rattled across the bridge, a huge flock of pigeons soared in the sky, which at the time ruined the image for me, since many of the birds looked like dark blobs that resembled dust on the emulsion. The other difficulty was more serious. Central Vermont Railway 447 northbound at Millers Falls at 4:50PM on May 14, 1986. I was using an old Leitz 50mm collapsible Summitar lens which had a loose front element and had lost its critical sharpness. Although on a small scale the photos made with this lens appear ok, when enlarged they are unacceptably soft. I’ve electronically sharpened the photo here to make it more appealing for internet presentation. Ultimately, I discontinued the use of the soft lens, but it took me several months before I recognized and accepted the problem, and found funds to rectify it. 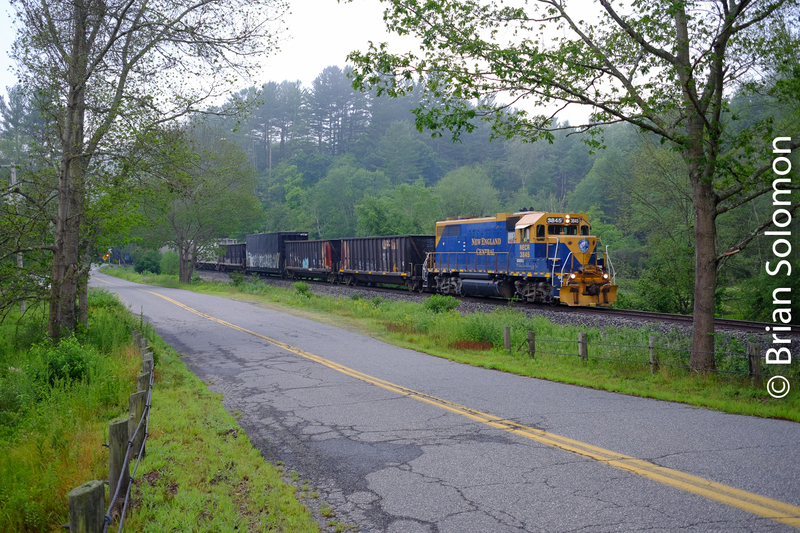 New England Central at Eagleville Dam (Part 2). Here’s a view I made last week of New England Central’s southward 608 as it passed the old mill dam at Eagleville, Connecticut. I’m curious to know more about the mill. All I know is that the dam and mill pond remain. The area is now a public park. Monday, January 14, 2019: New England Central at Eagleville Dam (Part 1). 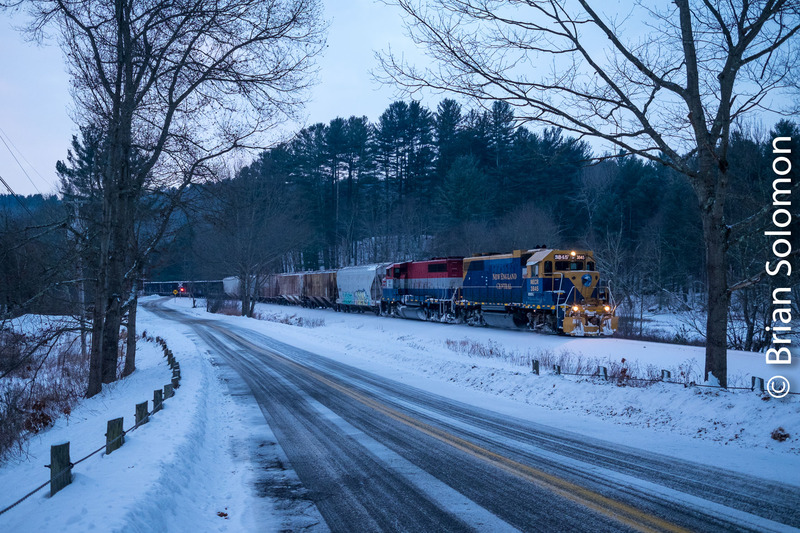 In the last light of a winter’s evening, I exposed this view of New England Central’s southward 608 as it approached Eagleville, Connecticut. Which is the subject of the photo: the train or the waterfall? Exposed digitally using a FujFilm XT1 with 27mm pancake lens. New England Central 608 Stafford Springs—Part 3. 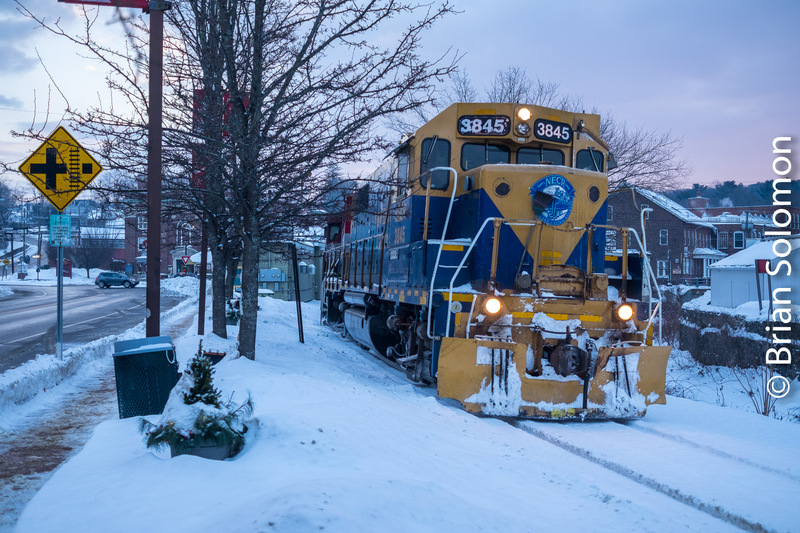 As New England Central 608 approached downtown Stafford Springs on January 14, 2019, I set my Nikon F3 to expose a textured image. The old buildings adjacent to the tracks are as much of a visual attraction as the train itself. Working with an f1.8 105mm lens, I exposed three frames of Kodak Tri-X. To process the film, I used my custom tailored split process, that uses two developers, followed by selenium toning of the fixed negatives. This maximizes the tonality of the film, while giving me glossy highlights. A secondary effect of the toner is the slight lavender hue. After processing, I scanned the negatives in color using an Epson V750 scanner. Although Brian is traveling, Tracking the Light still Posts Daily. 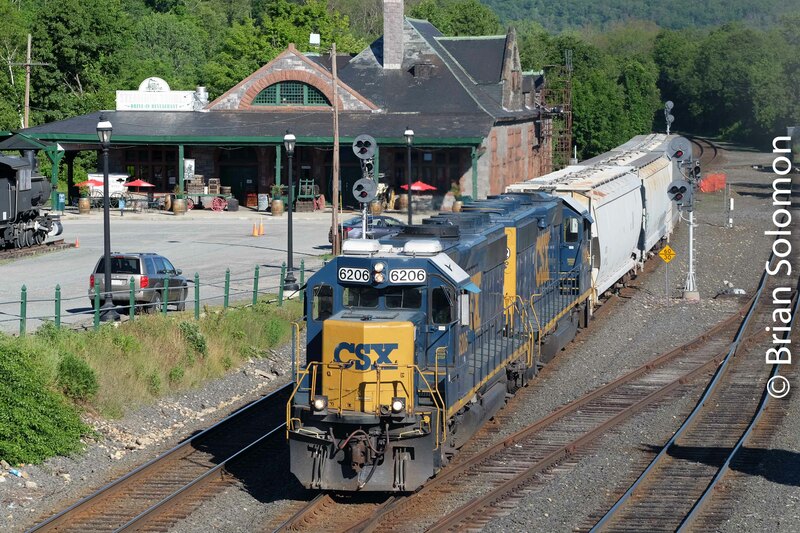 Stafford Springs and New England Central 608: Part 2. 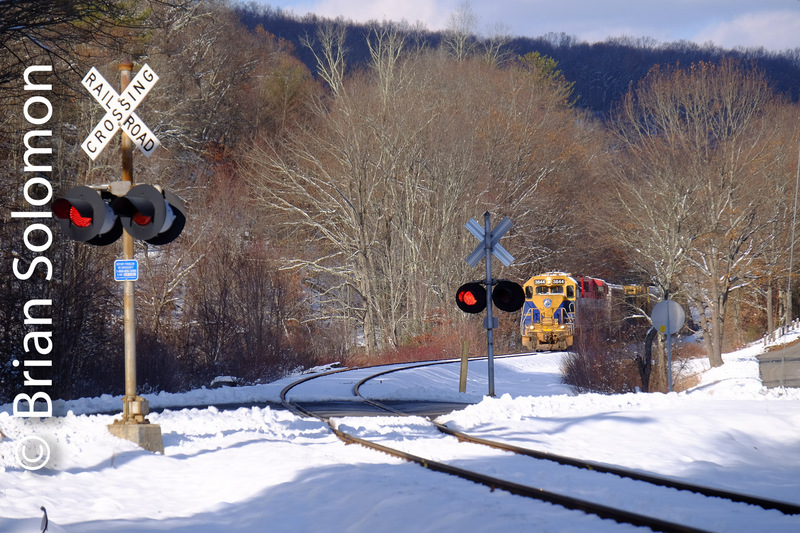 On Wednesday, December 12, 2018, I revisited the scene at Stafford Springs, having made photos there two days earlier. 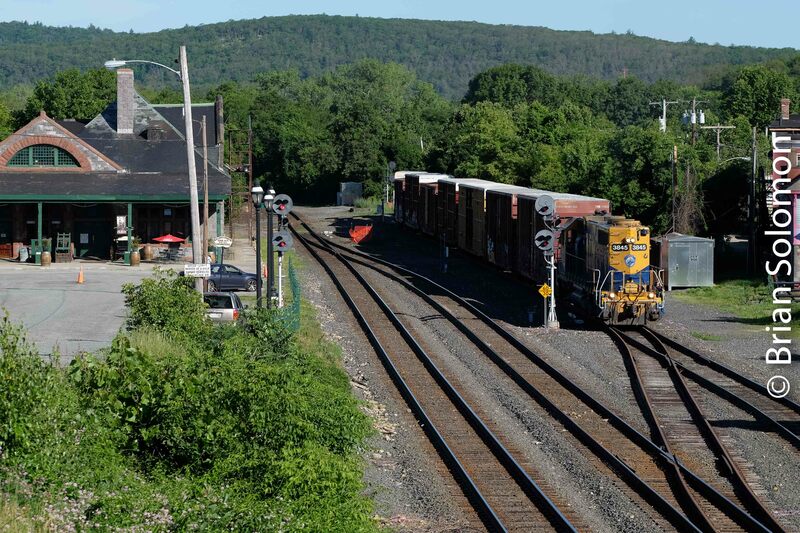 In fact, I’ve been photographing trains passing this Connecticut village since the early 1980s, but I find it always helps to try to look at an old place with fresh eyes. I like the arrangement of old brick buildings, the tracks along the creek/old mill race, and other elements characteristic of southern New England. 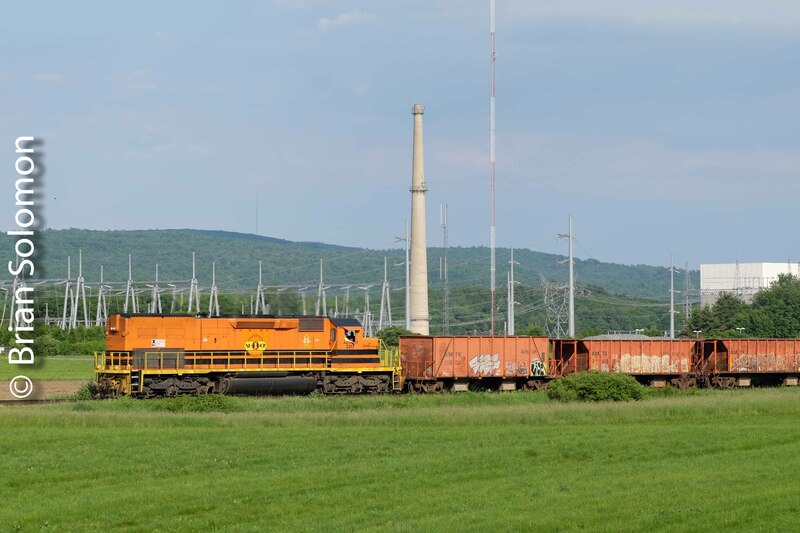 Working with my FujiFilm XT1 with 18-135mm lens, I exposed these views of New England Central 608 on its return journey from Palmer to Willimantic. New England Central-12mm Broadside View. 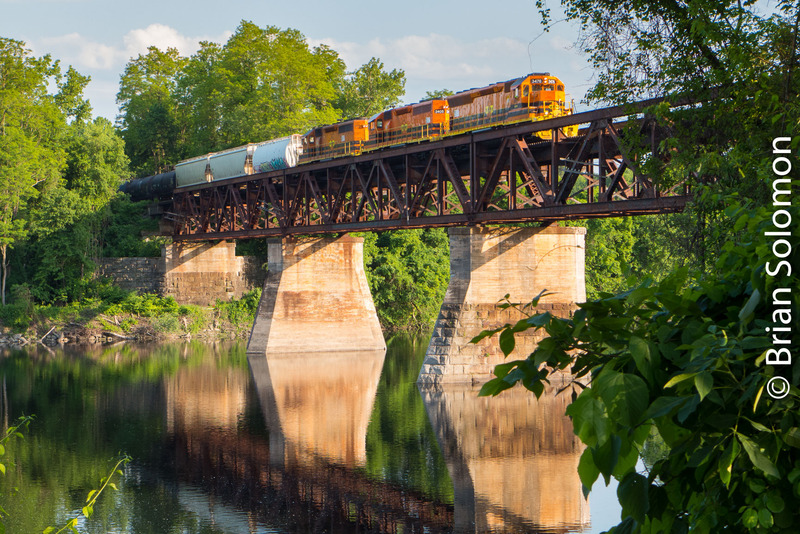 Clear evening, northward freight, five units and a deck-girder bridge; working with my FujiFilm XT1, I made this broadside view at Three Rivers, Massachusetts of New England Central’s 611 on its return run from Palmer to Brattleboro, Vermont. My Zeiss 12mm Touit is a special application lens. It’s very wide, very sharp, and free from barrel distortion. However, its necessary to keep the camera level to avoid line convergence as a result of the wide field of view. Four Orange SDs—New England Central’s 611 at Three Rivers. A clear sky and low autumn sun begs for photography. Yesterday, Mike Gardner and I visited Palmer, Massachusetts for lunch at the Steaming Tender, located in the old Union Station, where CSX’s former Boston & Albany crosses New England Central’s former Central Vermont. Not a wheel turned. So after lunch, I ascertained that New England Central’s 611 was close. Off we went, driving north. 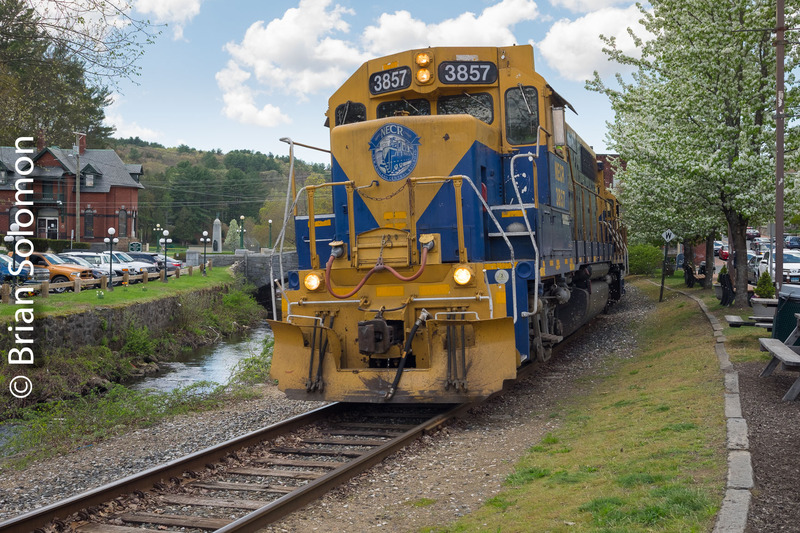 At Three Rivers we saw the freight crawling south through town and hastily set up our photograph. 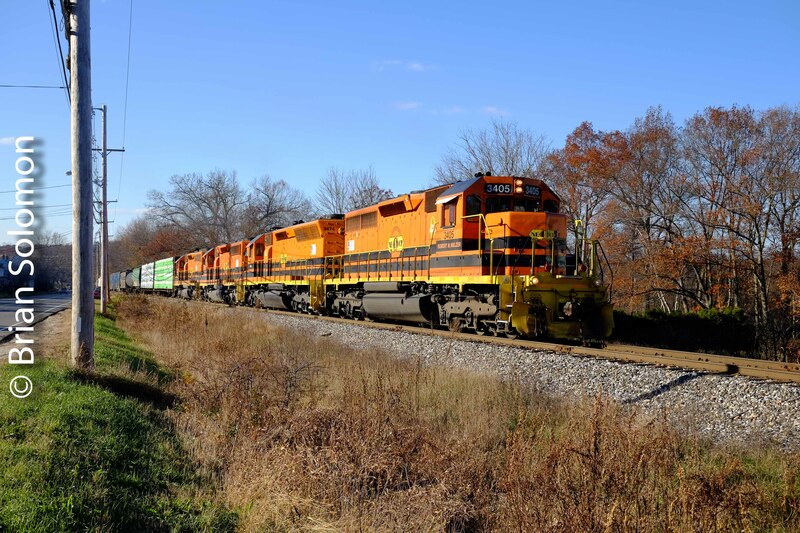 Nothing fancy; this is just a traditional three-quarter view of a colorful freight in nice afternoon light with late autumn foliage. There’s something satisfying about that. New England Central at Hospital Road—Two Views. Far and Near, which do you prefer? 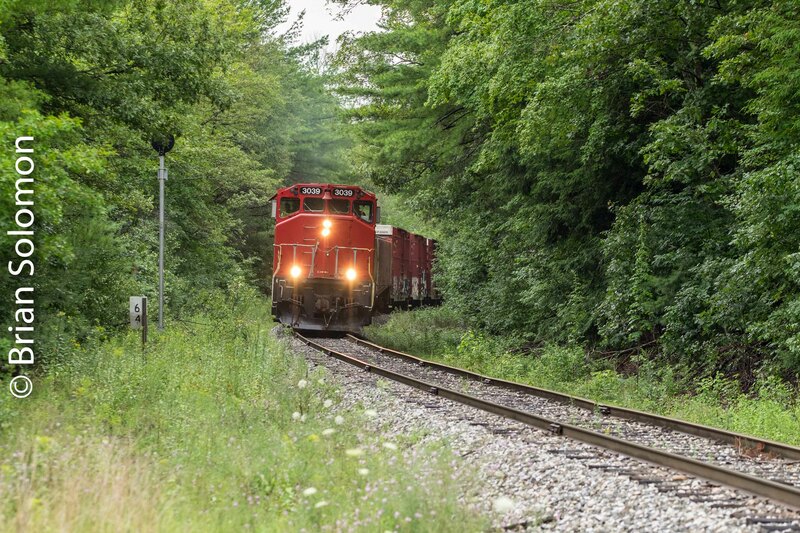 Both views were exposed on a soft morning at Hospital Road in Monson, Massachusetts of New England Central freight 608 on its northward run to Palmer. 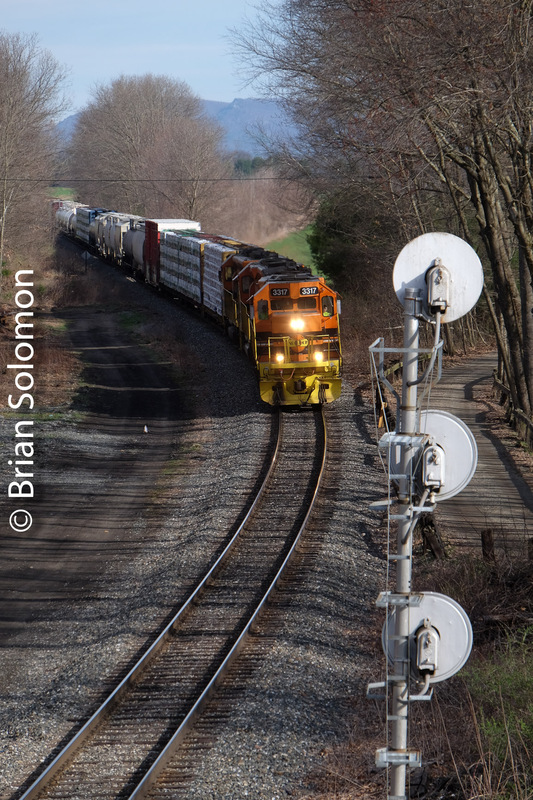 Working with a 90mm fixed telephoto lens, I made a distant view that better shows the train in the curve, followed by a tight view focused on the locomotives. Other features include the distant signal to the Palmer diamond and milepost 64 (measured from New London, Connecticut). I set my exposure manually to avoid under exposure as a result of the camera meter reading the bright locomotive headlights. 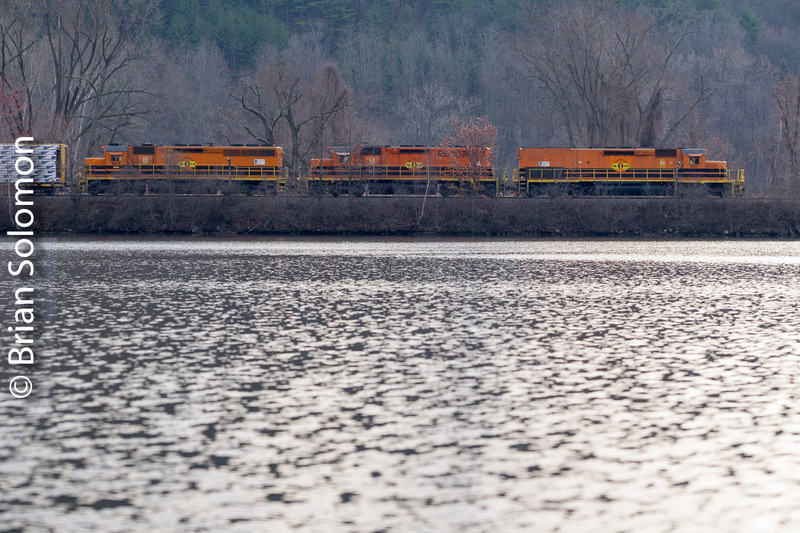 Glistening Water—New England Central on the move at Brattleboro, Vermont. 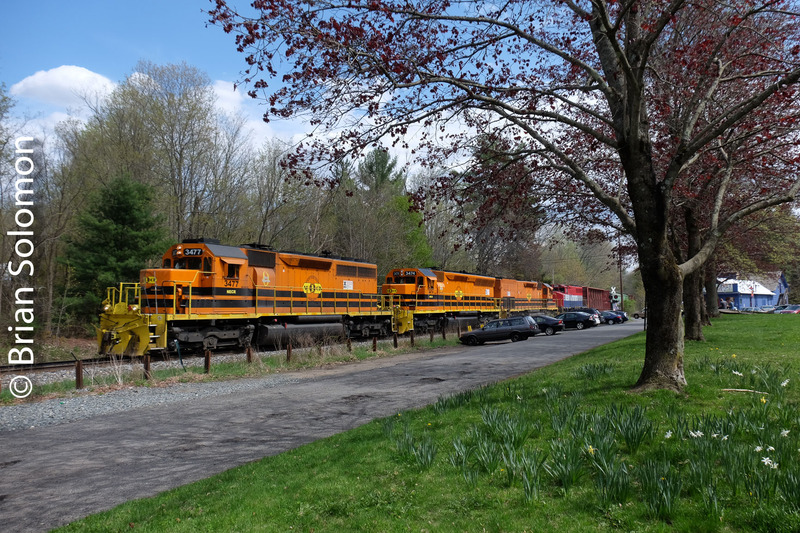 At 8:08 AM on April 27, 2018, New England Central 611 was on the move south from Brattleboro, Vermont. Bright hazy sunshine made for excellent conditions for photography. Working with my FujiFilm XT1 with 90mm telephoto, I exposed this view looking across the Connecticut River backwater south of Brattleboro yard. 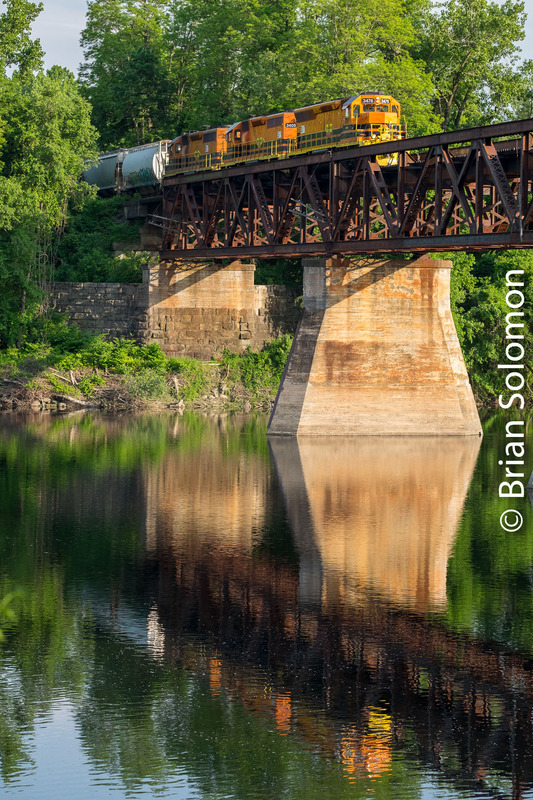 By cropping the sky, featuring the locomotives in the top third of the frame, and allowing the natural patterns of glistening water to occupy most of the image, I create visual tension that keeps your eye scanning the photo. I chose a broadside view to feature the locomotives, each of which is of a different length; SD40T-2, SD40, and SD45 (three of my personal favorites). To make the most of this contrasty scene, I imported the Fuji RAW file into Lightroom and made minor adjustments to highlight and shadows to improve the appearance of the image, then slightly boosted saturation to make for a more pleasing photograph. 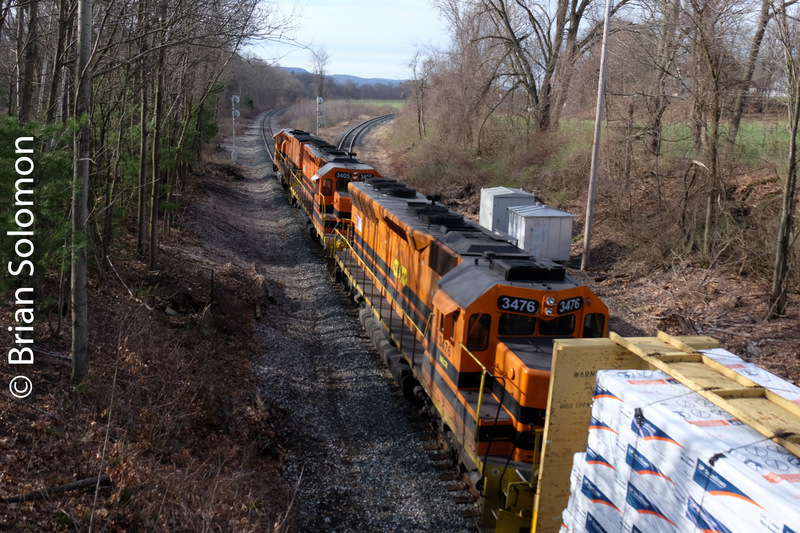 NECR freight 611 was on the move toward Palmer, Massachusetts and a bright morning on hand, so the chase was on! Frosty Morning Stafford Springs; White Balance. 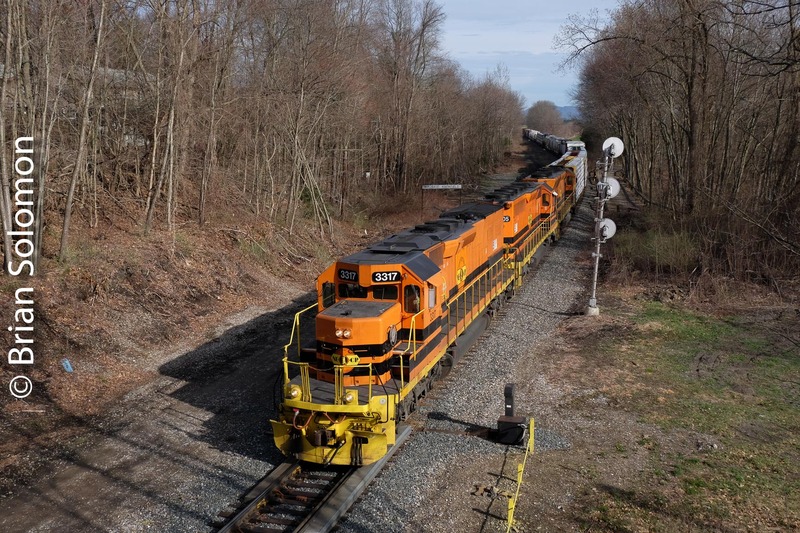 I made these views of New England Central job 608 working timetable northward at Stafford Spring, Connecticut. It was about 7:30am, and the sun was just tinting the eastern sky. Rather than set my camera with ‘auto white balance’ (a typical default setting), I opted to fix the white balance with the ‘daylight’ setting. Auto white balance arbitrarily selects a neutral color balance and adjusts the balance based on the conditions at hand. This is a useful feature in some situations, such as photography under incandescent lighting, or in situations with mixed lighting, such as in a museum or subway. However, auto white balance settings have the unfortunate effect of minimizing the colorful effects of sunset and sunrise and so using the ‘daylight’ setting is in my opinion a better alternative. But there’s really much a more complex problem; the way that digital cameras capture images is completely different to the ways the human eye and brain work in fixing visual stimuli. You could write a book on that! Is the closer view better? Tracking the Light Posts Different Photos Every Day! Difference of Seasons: July versus January—Two Views. 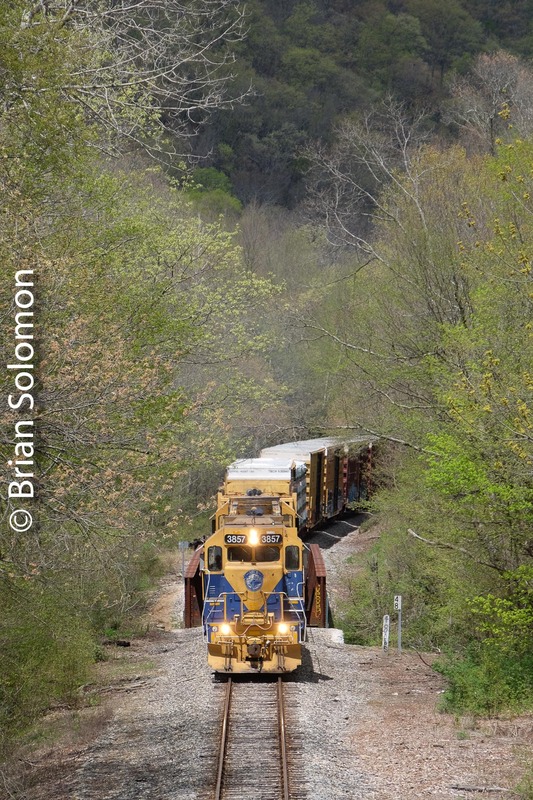 Here are two views of the same train: led by the same locomotive, at the same location, more or less at the same time of day, exposed using the same camera with the same lens. 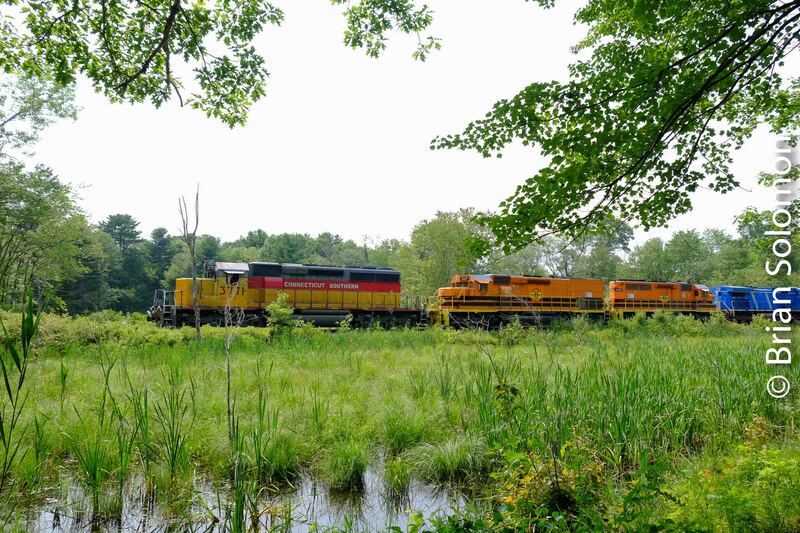 Both photos show New Engand Central job 608 led by GP38 3845 working northward in the morning along Plains Road in Willington, Connecticut (south of Stafford Springs). Photos were exposed digitally using a FujiFilm XT1 with 27mm pancake lens. The slight difference in angle may be attributed to the inconvenience of a mushy snow bank along the road in winter view that was not a problem in the summer. New England Central 3845 north on July 28, 2017. 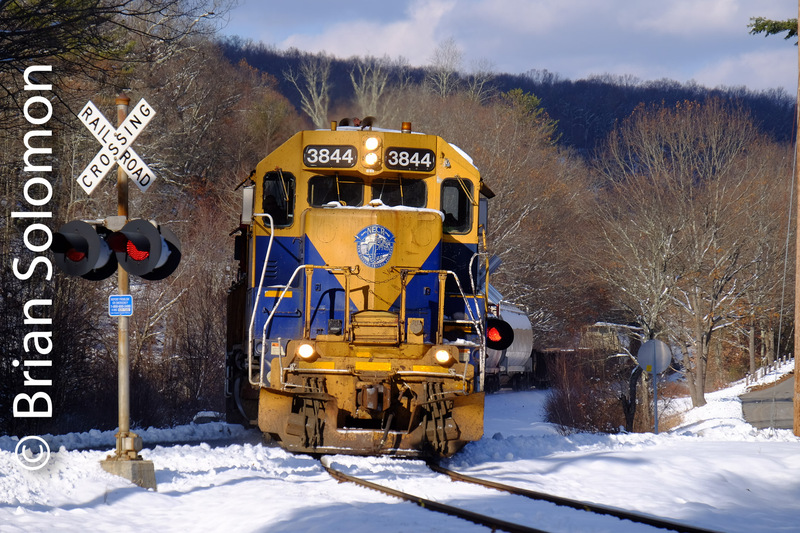 New England Central 3845 north on January 9, 2018. New England Central in the Snow. Sun and freshly fallen snow makes for a nice setting. 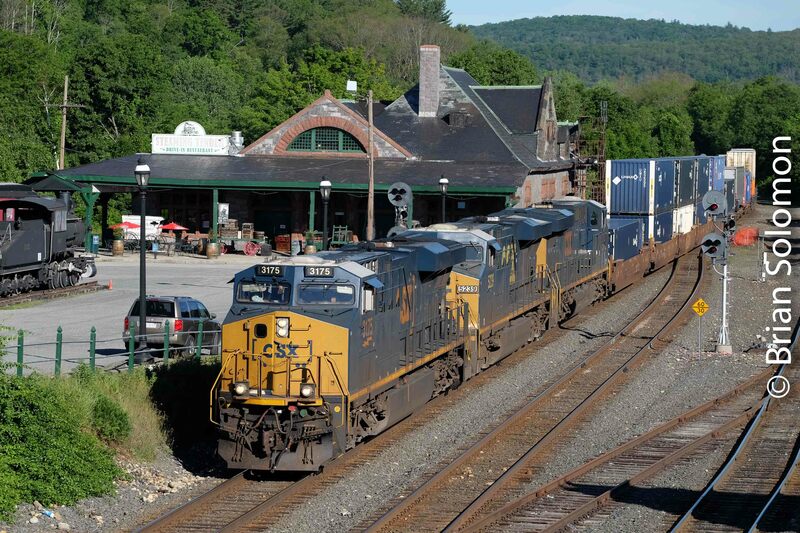 New England Central job 608 was making its way from Palmer back to Willimantic with about 20 cars of freight. 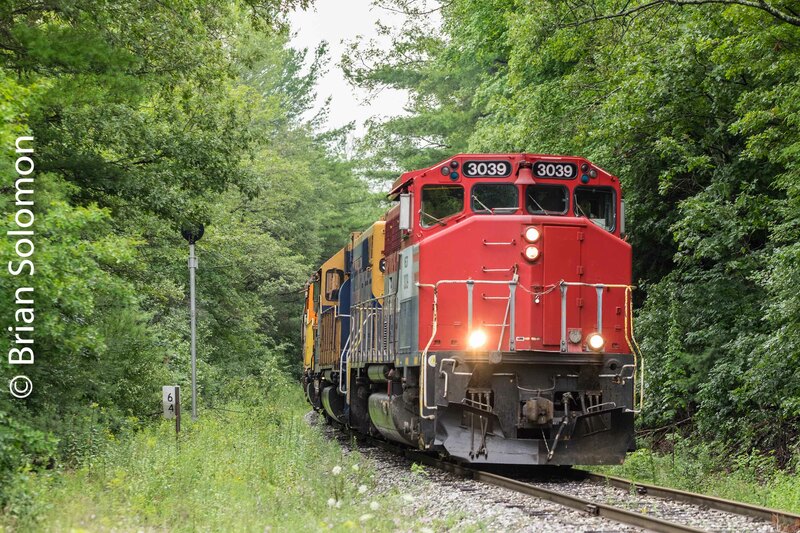 In the lead was one of the railroad’s original GP38s, still wearing the classic blue and yellow livery that was applied to these locomotives at the time of New England Central’s start-up in 1995. I made this view at Plains Road south of Stafford, Connecticut. Although much of the location was shadowed, a shaft of sun on the grade crossing made for photo opportunity with a telephoto lens. I stood back a bit to allow for slight compression effect owing to the longer focal length, and aimed to frame the leading locomotive between the crossing signals. This distant view shows how the light was falling on the scene. I set my camera to ‘turbo flutter’ (motor drive at ‘continuous high’) and exposed a burst of images when the locomotive approached the window of sunlight on the crossing. I set my focus point slightly off-center to hit the locomotive square in the nose. FujiFilm X-T1 with 18-135mm lens set at 104mm (equivalent to a 156mm focal length on a traditional 35mm film camera). ISO 200, f7.1 1/500th of a second. NECR 3476: Orange Locomotive in Winter Light. The combination of snow on the ground, very cold temperatures, and low light make for excellent photographic conditions, if you can bear to be outside. I exposed this view of New England Central 3476 shortly after sunset in Palmer, Massachusetts. NECR 3476 has a complicated history. Today it may be considered to be a SD40M-2. Originally an General Motors Electro Motive Division SD45 built for Southern Pacific Lines affiliate Cotton Belt, it was remanufactured in the 1990 which transformed it from 3,600 hp machine (as powered by 20-cylinder 645-diesel) into a 3,000hp machine (with 16-cylinder version of the EMD 645-diesel) while retaining the tapered (or ‘flared’) radiator intake vents at the back the of locomotive that were characteristic of EMD’s higher horsepower designs. The snow reflects light from below, thus providing greater illumination of shadow areas that under ordinary conditions would be underexposed at this time of day. Cold temperatures and clear overhead conditions result in a inversion effect, which traps particulates and other airborne impurities that acts as a light filter resulting in a scene with more red and magenta spectrum than normal. This effect is intensified at sunset because the sunlight has to pass through much greater amounts of polluted atmosphere because of its relative angle to the ground. To make the most of these lighting conditions, it helps to set the camera white balance to ‘daylight’, since ‘auto white balance’ while tend to cancel out the effect of the rosy lighting conditions. Haircut and an SD40-2 Trailing View. The other day I was on my way to get a haircut when I passed under New England Central’s 611 departing Palmer, Massachusetts for Brattleboro, Vermont. The weather was poor, the lighting bland and I had an agenda of things to attend to. But I had my Lumix LX7 handy and I went after 611 anyway! I made this trailing view using my Lumix LX7 handheld. My head-on views were not worth describing here. Not today anyway. However, I like this trailing view at Barretts, Massachusetts of New England Central 721, still in Union Pacific paint (but with NECR lettering). 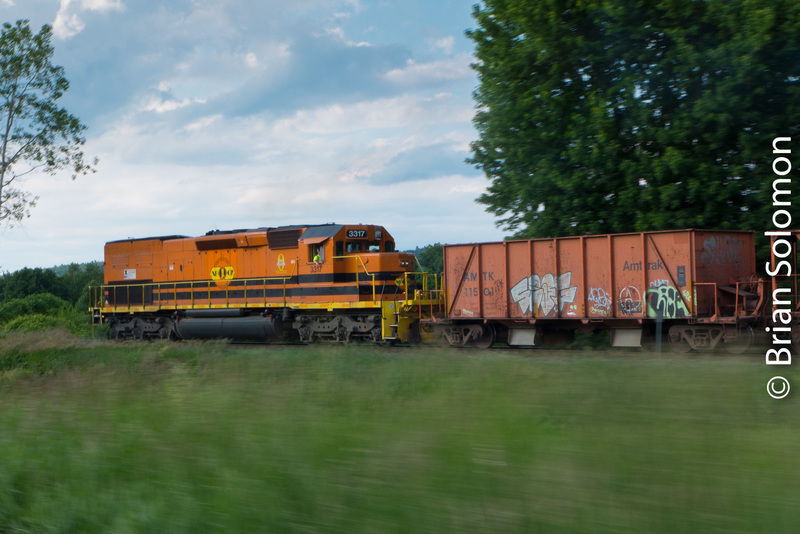 This captures some of the drama of the accelerating freight and makes reasonably good use of the lighting. Afterwards I resumed my mission to get a hair cut. My point? 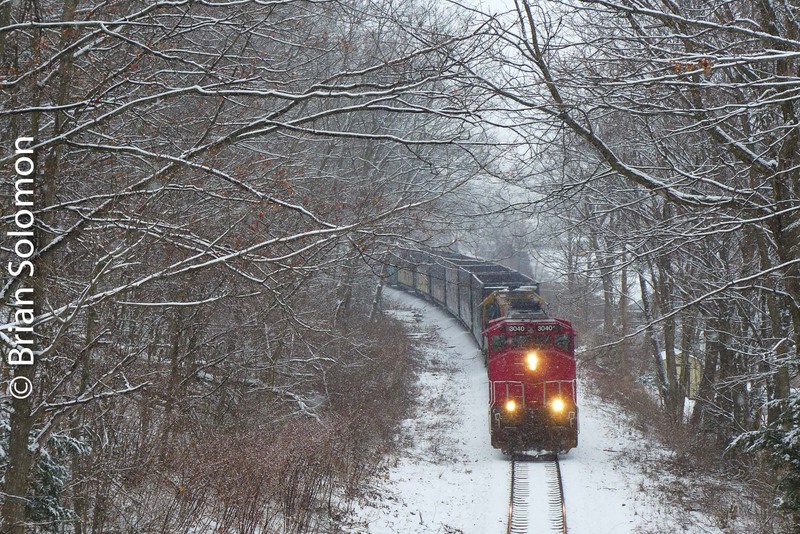 Whenever possible, regardless of the weather and other things to do, I take the time to make photographs; of railroads and whatever else catches my interest. I wanted to write, ‘why sometimes winter is better.’ Except this is a late autumn photo. (If you accept that the Winter Solstice is the defining date for the beginning of Winter.). 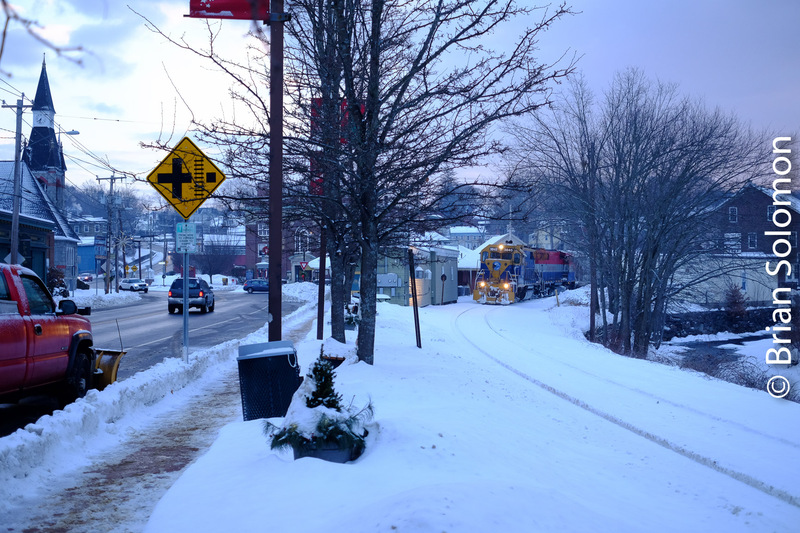 On December 6, 2017, Paul Goewey and I arrived at Depot Road in Leverett, Massachusetts several minutes ahead of the southward New England Central road freight, job 611 from Brattleboro. I was interested in exploring this angle looking toward the rock cut immediately north of the old station location. I’ve made a number of views from the old station area in summer, when the cutting tends to be obscured by brush and harshly shadowed. And that’s why sometimes Winter (or late autumn) is better. The lack of foliage combined with diffused light opens up numerous photo possibilities that are impractical when the trees are leafed out and underbrush is thick. Exposed using a FujiFilm X-T1 with an 18-135mm lens. Exposed using a FujiFilm X-T1 with 18-135mm lens. Zoom Lens at Millers Falls. A ‘zoom lens’ is a lens with adjustable focal length. Often the term is confused with a telephoto. Where a zoom lens may be a telephoto, it isn’t necessarily so. In the case of my 18-135mm Fujinon lens, this is a wide-angle to medium telephoto range zoom. 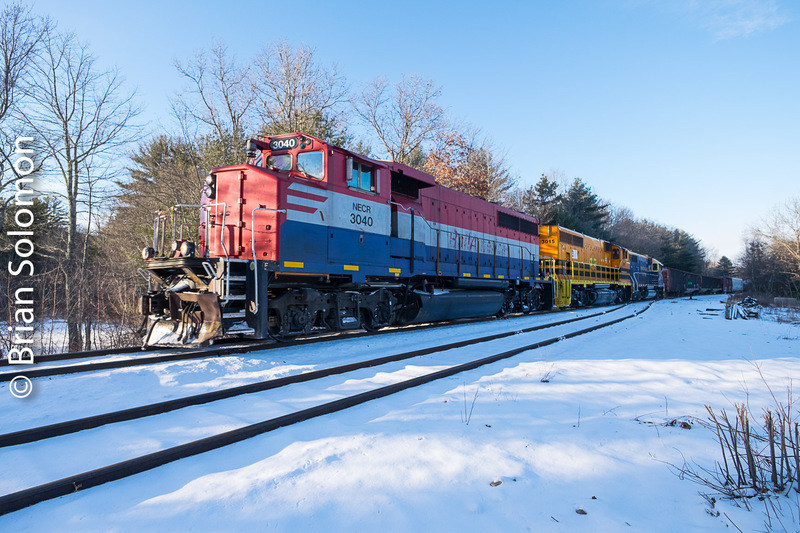 I used this to good advantage the other day at Millers Falls, Massachusetts to make a sequence of photos of New England Central’s southward road freight 611. Both of these photos were exposed from the same vantage point. 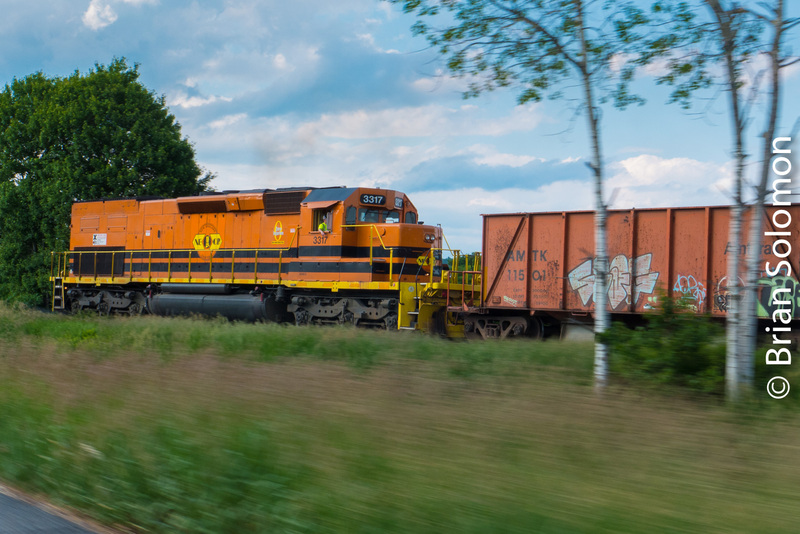 All I did was adjust the focal length of the zoom as the train approached. Telephoto view; 18-135mm zoom lens set at 116mm (equivalent of 174mm on a 35mm film camera). Wide angle view from the same vantage point. 18-135mm Fujinon zoom lens set to 23.3mm (equivalent to a 35mm lens on a traditional 35mm film camera.) Incidentally; when making these comparisons it is crucial to distinguish between historic film size and the focal length of the lenses. Both photos were exposed digitally. Big Orange & Black Diesel; When Color Works. 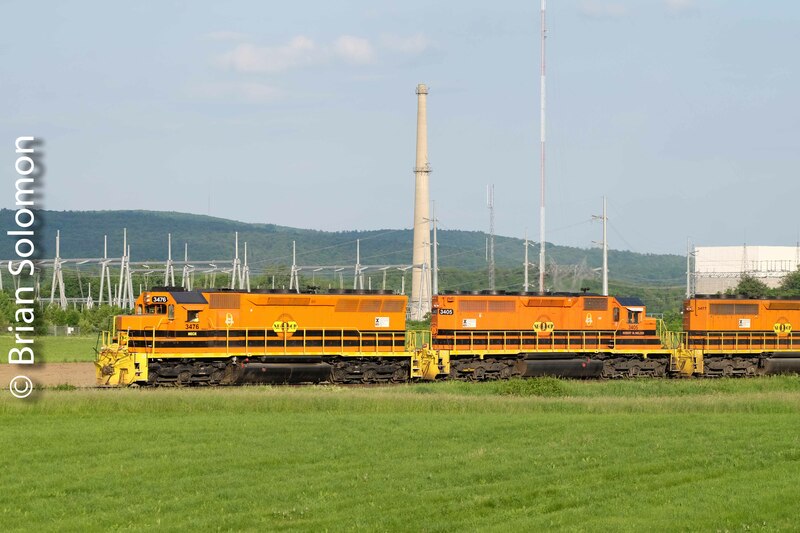 Since Genesee & Wyoming took over Rail America, gradually the fleets of diesels operated by the component railways have been repainted into G&W’s corporate livery of orange and black with yellow highlights. This traditional paint scheme had been used by the original G&W short line railroad for decades. Here I’ve put the brightly colored diesels in scene that makes the most of the scheme. New England Central 611 is southbound at Northfield, Massachusetts with locomotive 3475 in the lead. A cloud has briefly diffused the morning sun. 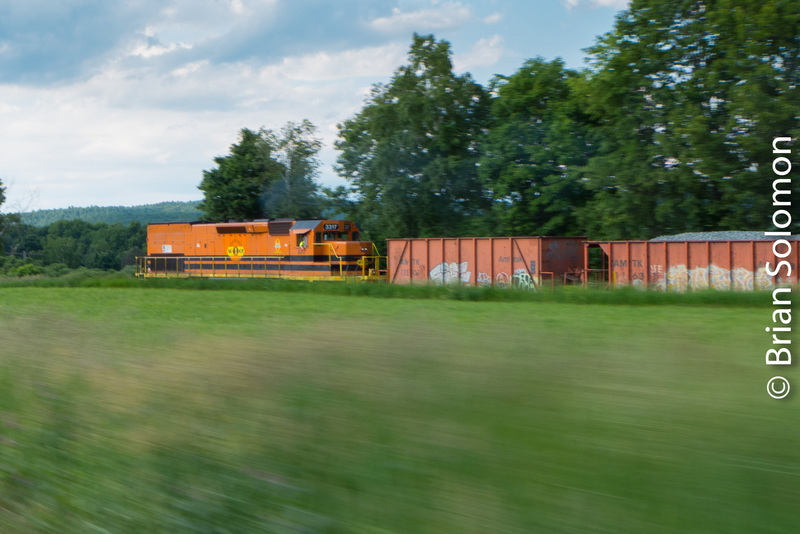 To make the most of the lighting and the scene, I made this telephoto view looking down a road, visually placing the orange and black locomotive in front of a yellow house. The dominance of orange and yellow for the primary subjects works well in the late autumnal scene, as these colors mimic the muted foliage and grasses associated with the season. 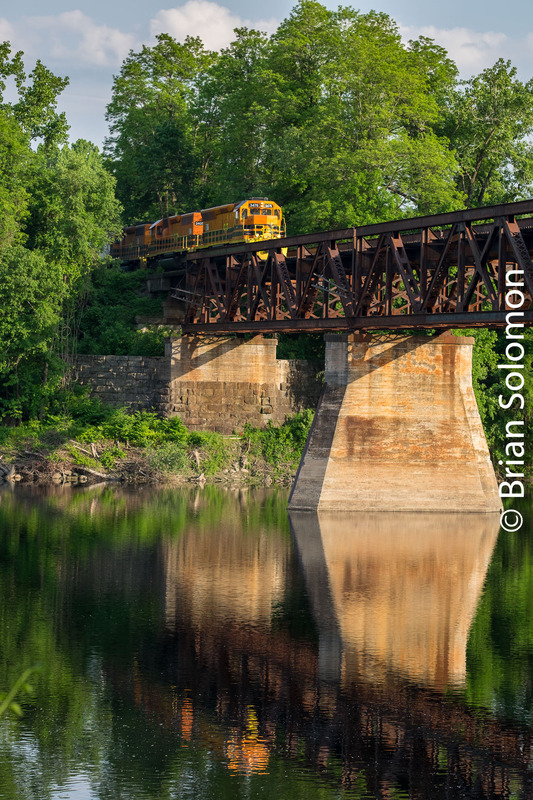 Last week I exposed this view of New England Central 611 (Brattleboro to Palmer) crossing the Connecticut River at East Northfield, Massachusetts. 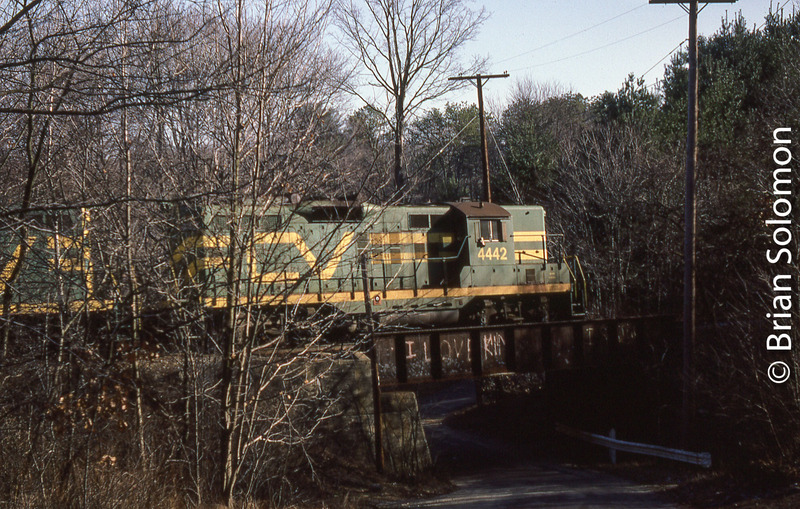 New England Central 611 crosses the Connecticut River at East Northfields, Massachusetts. Exposed with a Fuji Film XT1. To compensate for the back lit high-contrast scene, I made a few necessary adjustments in post processing. Working with the Camera RAW file, I applied a digital graduated filter across the sky and locally lowered highlight density, while altering the contrast curve and boosting saturation. I then made global adjustment to contrast and saturation across the entire image, while brightening the shadow areas. The intent was to better hold detail in the sky. To make this possible, it was necessary to expose for the sky, and allow the train and bridge to become comparatively dark. I did this knowing I’d make adjustments after the exposure. For more detail on this photographic technique see: Irish Rail 085 with Ballast Train at Sunset—lessons in exposure and contrast adjustment. New England Central 611—Two Exposures. Picking the best exposure is an important part of photography. Today with modern metering, computer guided exposure aids (program modes) and automatic lenses, most photographers don’t spend a lot of time worrying about exposure details. It might surprise some Tracking the Light readers that in most instances I set my exposures manually, and I only use camera metering in an advisory capacity (In other words I look at the camera meter but don’t necessarily accept its advice). While I often use my Lumix LX7 in ‘A’ mode, I routinely over-ride the camera’s exposure advice using manual controls. With my FujiFilm XT1 and Canon digital cameras (and film cameras), I almost always set my exposure manually. 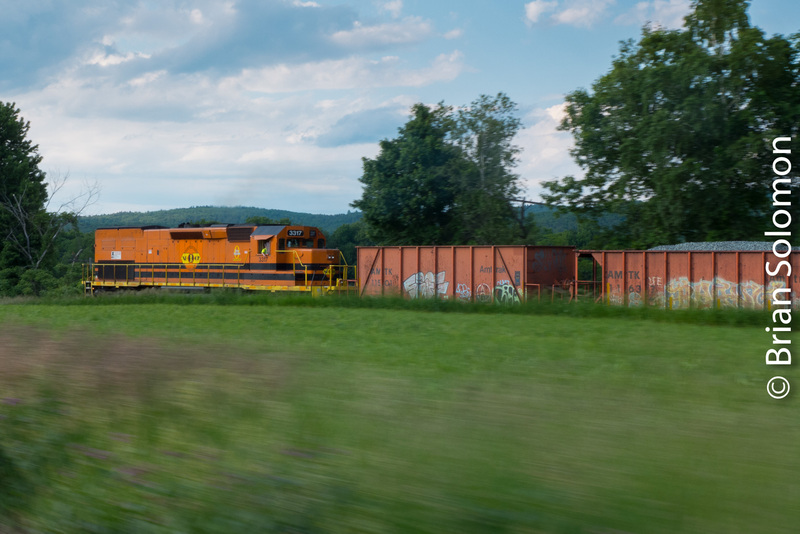 Last week, working with my FujiFilm XT1 I made these views of New England Central freight 611 working south of Brattleboro, Vermont. The stunning scenic setting of the Connecticut River backwater combined with dramatic morning cross-lighting and a dark background makes for an excellent illustration of a difficult lighting situation. Here, many camera automatic modes might grossly overexpose the scene in a misguided attempt to compensate for the dark background. I’ve metered manually and gauged exposure using the camera’s histogram (set up to show the distribution of pixels in regards to exposure.) I’ve offered two variations here, exposed 1 full stop apart. A ‘stop’ is a standard increment of exposure. The amount of light reaching the sensor or film doubles/halves with each change of one stop. So going from an aperture setting of f4 to f5.6 (one stop) cuts the light by half. Likewise, a shutter speed change from 1/250 to 1/500 will also cut the amount of light by half. Both exposures are acceptable, but you may have a preference for one versus the other. The photos here have not been altered for density, color balance or color temperature in post processing; both are scaled versions of the camera produced JPGs.